ITS Guest Lecture: Making wise decisions in respiratory medicine based on patient data – Professor Martin Tobin, Professor of Medicine, Division of Pulmonary and Critical Care Medicine, Hines VA Hospital and Loyola University of Chicago Stritch School of Medicine. Kindly supported by Boehringer Ingelheim Ireland through an unrestricted educational grant. 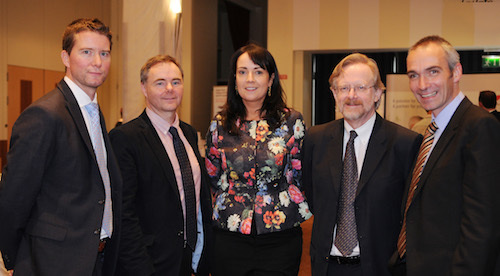 Pictured are: Dr Brian Canavan, St Luke’s Hospital, Kilkenny, Prof Richard Costello, RCSI, Beaumont Hospital, Ms Denise Eggleston, Boehringer Ingelhim Ireland, Prof Martin Tobin, Loyola University of Chicago and Prof Anthony O’Regan, Galway University Hospitals. 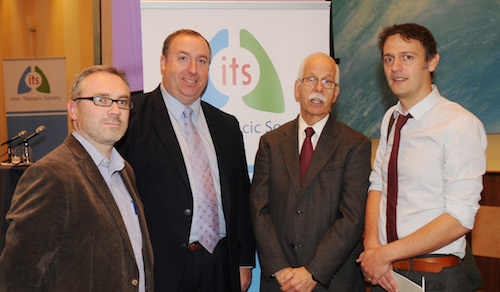 ITS Pro Con Debate: Lung Cancer Screening – Dr James Jett, National Jewish Health, Denver, Colorado and Dr Cyrus Daneshvar, Plymouth University Hospitals Trust. Kindly supported by Boston Scientific through an unrestricted educational grant. 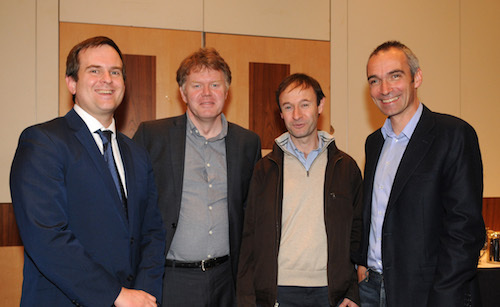 Pictured are Dr David Breen, Galway University Hospitals, Mr Tom Martin, Boston Scientific, Dr James Jett, National Jewish Health Centre, Denver and Dr Syrus Daneshvar, Plymouth University Hospitals. ITS Case Study Forum. Kindly supported by Astra Zeneca through an unrestricted educational grant. 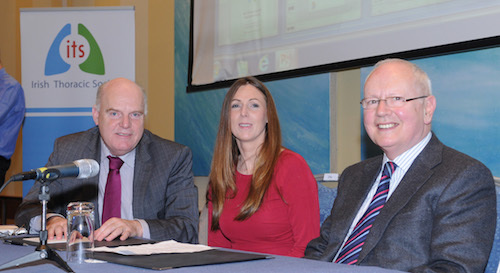 Pictured are Prof JJ Gilmartin, Galway University Hospitals, Dr Jackie Rendall, Belfast City Hospital and Prof Muiris X FitzGerald, UCD (Forum Chairs).